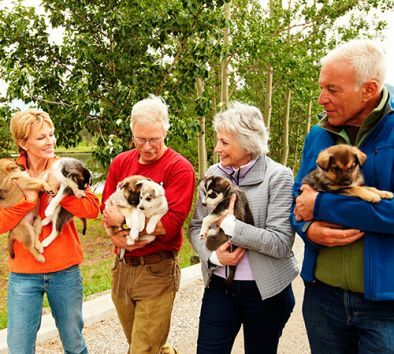 Enjoy a warm welcome and experience a true Alaskan lifestyle at Husky Homestead—home of Iditarod Champion, Jeff King. This tour is widely heralded as an authentic look into rural lifestyles based on 35 years of Alaskan adventures from freight hauling on Denali to crossing the finish line in Nome, Alaska with a champion Iditarod team. Get a behind-the-scenes look at what goes into creating a championship team and carving a life in Alaska’s Interior. Hear compelling stories from the trail and see actual racing sleds, arctic survival gear and equipment used to traverse 1,100 miles of Alaska’s most rugged terrain. Dress in warm layers. Wear comfortable walking shoes. Bring a jacket, gloves and a hat. Children under the age of 16 must be accompanied by parent or guardian. Outside portion of this tour is approximately 45 minutes, inside portion is approximately 30 minutes.